I would like to share a real life story with all my friends and especially all my colleagues and all Maybank account holders. This incident happened on today evening (1 April 2008). I went to the PJ State (Also known as PJ New Town) Maybank to withdraw RM500. Unfortunately for me, only 9 RM50 notes came out instead of 10. What happened was, one of the RM50 notes was folded exactly in half and placed at a corner of the stack (Please refer to the attached pictures showing how two RM50 notes can be counted as three). I was so upset because I have no proof that the ATM did not give me the correct amount. After much hesitation, I finally decided to call Maybank to complain about the incident knowing that I may not get back my money. But at least I can caution them of such incident. When I told of my situation to the Maybank Customer Service Representative, to my surprise, I was informed that I'm not the first victim. It seems that similar cases have occurred before. The lady explained that it is the malfunction of the ATM and the money may accidentally get folded in half. However when questioned, she was unable to explain to me why the money can be folded exactly in half and placed nicely in the corner of the stack. I believe this is the new technique of cheating money, done by the people who are responsible of placing the money into the ATMs. In the stack of money which is to be placed into the ATM, one RM50 note is folded nicely in half, for every one note taken out of the stack of money. 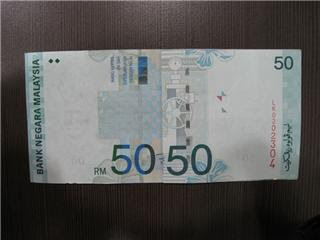 The folded RM50 notes are then placed at the edge of the stack and positioned in the ATM where the money would be counted. With that done, every one folded note would be counted by the machine as two notes. I may be wrong about how and why it happened, but I would like to warn everyone about this incident. Please be careful when withdrawing money from the ATM (it may happen to other banks as well) and do count your money to be sure. If such an incident really happened to you (*touch wood*), please do call up the bank to complain about this. If everyone keeps quiet about this, the bank may be unaware of such incidents and the people responsible may just continue doing what they do without getting caught! Even if it is actually because of the ATM malfunctioning, the bank should know about this and there is also a chance of you getting your money back. 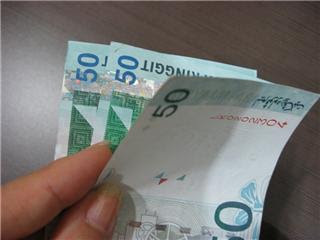 Two RM50 notes. The note on top is foolded to the right. The folded note is counted as two notes by the machine (two notes counted as three). Hi Monica, wow! First time I read about this. Good of you to bring this up. By the way, did you get a refund? And is there TV security cameras posted? I'm sure the Bank can check their accounts and trace back to your entry and find out the problem or what happened. I can imagine you now will count your money carefully next time, ha ha. Stay beautiful and have a nice weekend, Lee. Hi! It did not happen to me... I received the forwarded e-mail actually :-D Anyway, I'm sure they have CCTV cameras in and out and I was wondering how could this happen too. Thanks for the info. Scary nowadays...fraud cases. Wah, got problem like that one ah. Have to really count my money lor like that.